Posted on Mon, Apr 2, 2012 : 10:59 a.m. There will be a public auction on Wednesday at the Parthenon Restaurant in downtown Ann Arbor, which closed on Saturday after 37 years. Downtown Ann Arbor’s Parthenon Restaurant officially served its last gyro sandwich on Saturday after 37 years on the corner of East Liberty Street and South Main Street. Owners John and Steve Gavas -- who moved to Ann Arbor from Chicago in 1975 to open the restaurant -- now plan to take some much-needed down time. 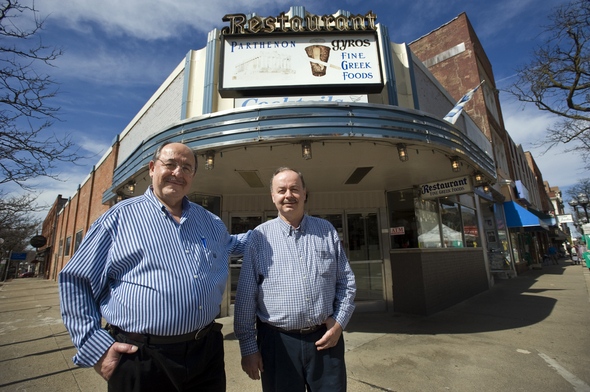 But first, the duo plans to have a public auction to sell off Parthenon’s remaining inventory. The auction will be held at the restaurant at 10:30 a.m. Wednesday. Among the items for sale: a flat top grill, display cooler, two cash registers, portable dance floor, 18 patio sets, marble top bar, commercial refrigerator, dishwasher, set of lockers, cigarette machine, Miller Lite and Budweiser neon signs, deep fryer and four burner stove top. To see a full list of the roughly 50 items for sale check here. Some inventory from Parthenon has already found a new home at other downtown Ann Arbor restaurants, such as the patio fencing that the owners of The Ravens Club purchased earlier this year. Now that the Parthenon has closed, the 8,000-square-foot, bi-level restaurant space won't sit empty for long. The owners of several local bars purchased the business in January and plan to open a new Cafe Habana concept this summer. Cafe Habana closed its former location on East Washington Street on Jan. 8 in preparation for the move. The neighboring Blue Tractor has since expanded into the former Cafe Habana space, while the Cafe Habana Cellar Lounge remains open beneath Blue Tractor. Although Cafe Habana owners Greg Lobdell and Jon Carlson, along with operating partner Dan Glazer and other investors, have not yet revealed their plans for the new Cafe Habana, they said the restaurant will reopen this summer following extensive renovations. Mon, Apr 2, 2012 : 6:07 p.m.
No gyro for me Saturday...I got the Lamb Shank with green beans and rice....gonna miss them and their wonderful staff...now I've got to make my own...but don't think I can ever make the skordalia like them! ???? ????! Mon, Apr 2, 2012 : 5 p.m.
Mon, Apr 2, 2012 : 5:22 p.m.
Mon, Apr 2, 2012 : 4:56 p.m.
We will miss this place!